Colombia , officially the Republic of Colombia (Spanish: República de Colombia, pronounced is a constitutional republic in northwestern South America. Colombia is bordered to the east by Venezuela and Brazil to the south by Ecuador and Peru to the north by the Caribbean Sea; to the northwest by Panama; and to the west by the Pacific Ocean. Colombia also shares maritime borders with Venezuela, Jamaica, Haiti, the Dominican Republic, Honduras, Nicaragua and Costa Rica. With a population of over 46 million people, Colombia has the 29th largest population in the world and the second largest in South America, after Brazil. Colombia has the third largest population of any Spanish-speaking country in the world, after Mexico and Spain. The territory of what is now "Colombia" was originally inhabited by indigenous people including the Muisca, Quimbaya, and Tairona. 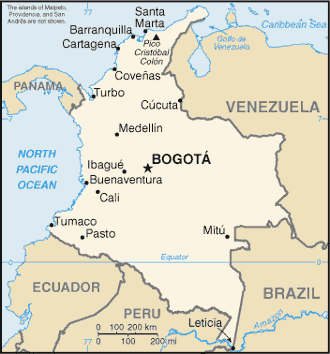 The Spanish arrived in 1499 and initiated a period of conquest and colonization creating the Viceroyalty of New Granada (comprising modern-day Colombia, Venezuela, Ecuador, the northwest region of Brazil and Panama) with its capital in Bogotá. Independence from Spain was won in 1819, but by 1830 "Gran Colombia" had collapsed with the secession of Venezuela and Ecuador. What is now Colombia and Panama emerged as the Republic of New Granada. The new nation experimented with federalism as the Granadine Confederation (1858), and then the United States of Colombia (1863), before the Republic of Colombia was finally declared in 1886Panama seceded in 1903 under pressure to fulfill financial responsibilities towards the United States government to build the Panama Canal. Colombia has a long tradition of constitutional government. The Liberal and Conservative parties, founded in 1848 and 1849 respectively, are two of the oldest surviving political parties in the Americas. However, tensions between the two have frequently erupted into violence, most notably in the Thousand Days War (1899–1902) and La Violencia, beginning in 1948. Since the 1960s, government forces, left-wing insurgents and right-wing paramilitaries have been engaged in the continent's longest-running armed conflict. Fuelled by the cocaine trade, this escalated dramatically in the 1980s. Nevertheless, in the recent decade (2000s) the violence has decreased significantly. Many paramilitary groups have demobilized as part of a controversial peace process with the government, and the guerrillas have lost control in many areas where they once dominated. Meanwhile Colombia's homicide rate, for many years one of the highest in the world, almost halved between 2002 and 2006. 2009 and 2010 saw an increase in the urban homicide rate, particularly in the city of Medellín, attributed to gang warfare and paramilitary successor groups. According to the Maplecroft research institute, in 2010 Colombia had the world's sixth highest risk of terrorism. Colombia is a standing middle power with the fourth largest economy in Latin America. Inequality and unequal distribution of wealth are widespread. In 1990, the ratio of income between the poorest and richest 10 per cent was 40-to-one. Following a decade of economic restructuring and a recession, this ratio had climbed to 80-to-one in the year 2000. By 2009, Colombia had reached a Gini coefficient of 0.587, which was the highest in Latin America. According to the Office of the United Nations High Commissioner for Human Rights, "there has been a decrease in the poverty rate in recent years, [but] around half of the population continues to live under the poverty line" as of 2008-2009. Official figures for 2009 indicate that about 46% of Colombians lived below the poverty line and some 17% in "extreme poverty".